The 44th season of Albright Theatre kicks off with a play-about-a-play comedy by Tom Dudzike, “Don’t Talk to the Actors,” September 8-10, 15-17, 22, 23. Fridays and Saturdays at 8pm, Sundays at 2pm. Novice playwright Jerry Przpezniak (Ryan Gentile) and fiancé Arlene Wyniarski (Kayleigh Aleck) move to New York to fulfill a dream. It doesn’t take long for their hopes and dreams to begin to unravel as the modest Midwesterners meet larger than life New Yorker actress, has been actor, way too picky stage manager and a director who struggles hopelessly to keep everything on track. “Don’t Talk to the Actors” is a fun, talented, well-paced, performance that will keep you smiling from through both acts. Directed by Jeff Pripusich, produced by Elizabeth Hilgart, with stage manager Cyndi Pripusich. 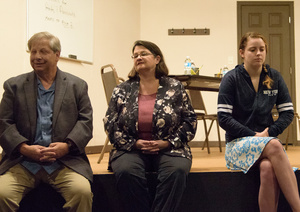 Left to right Jami Johnson (Geneva) as Lucinda Shaw; Jeff Pripusich (North Aurora), director; Ryan Gentile (Carol Stream) as Jerry Przpezniak; Tom Ochocinski (Plainfield) as Mike Policzek. The Albright Theatre is located on the 3rd floor of the Batavia City Hall, 100 Island Avenue, Batavia, IL. For information and tickets call 630-406-8838.